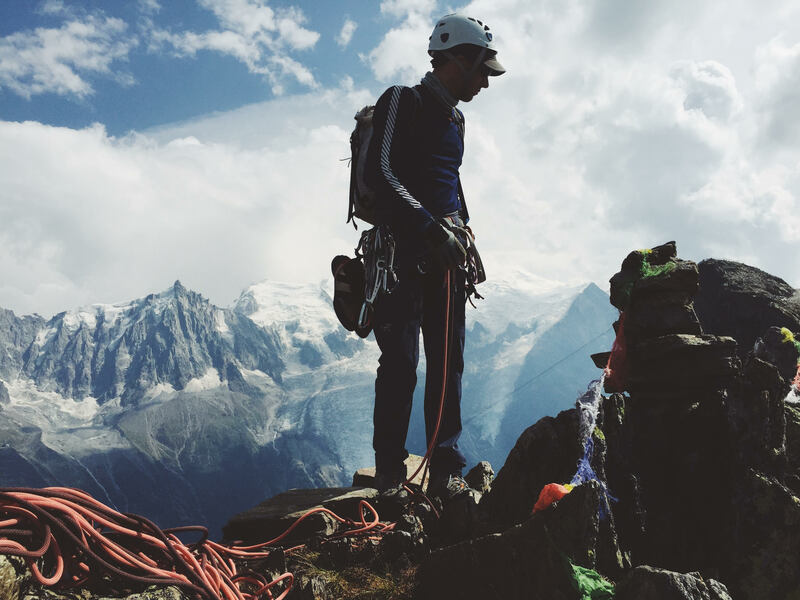 For climbers, of all kinds, Chamonix is a mecca. 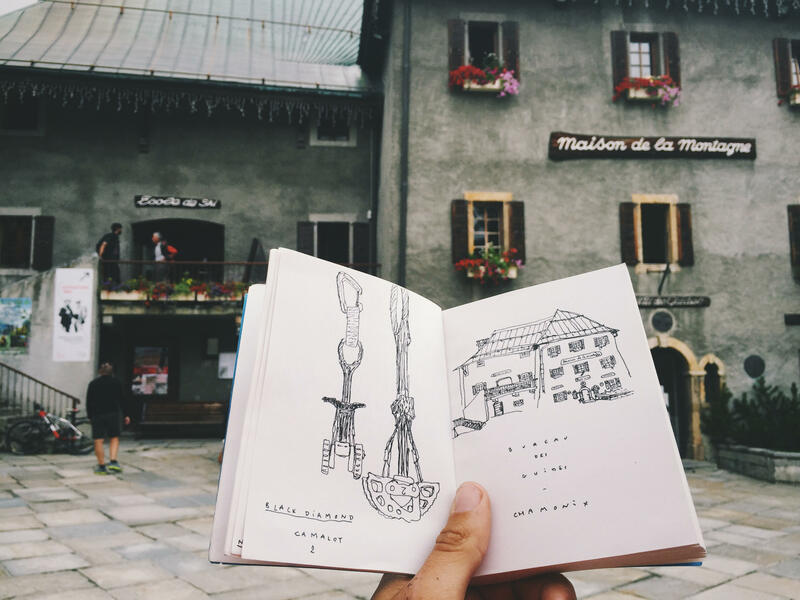 This little town in the french Alps is literally the birthplace of climbing. So I packed ropes and helmet and decided to check it out. 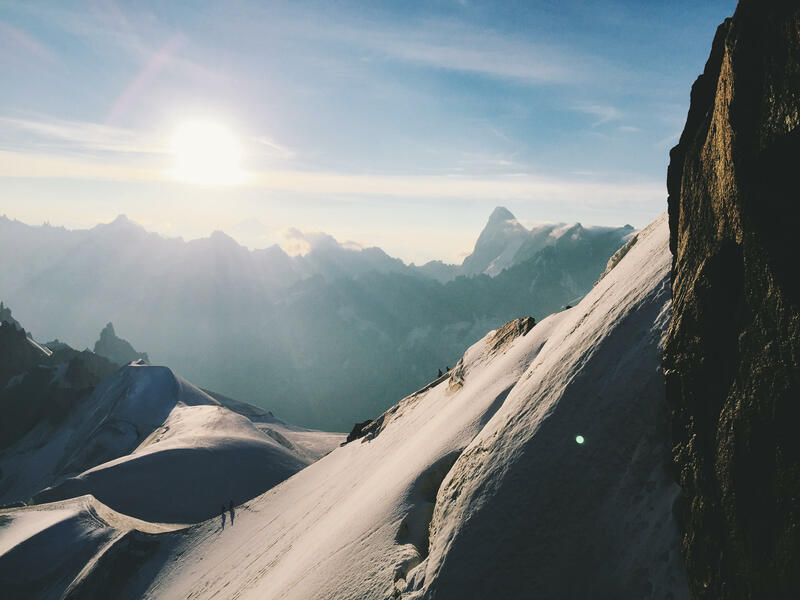 Chamonix is ideally located, at the foot of some of Europe’s most beautiful peaks and is now the number one destination for alpine climbers, mountaineers, hikers and all outdoor enthusiasts alike. 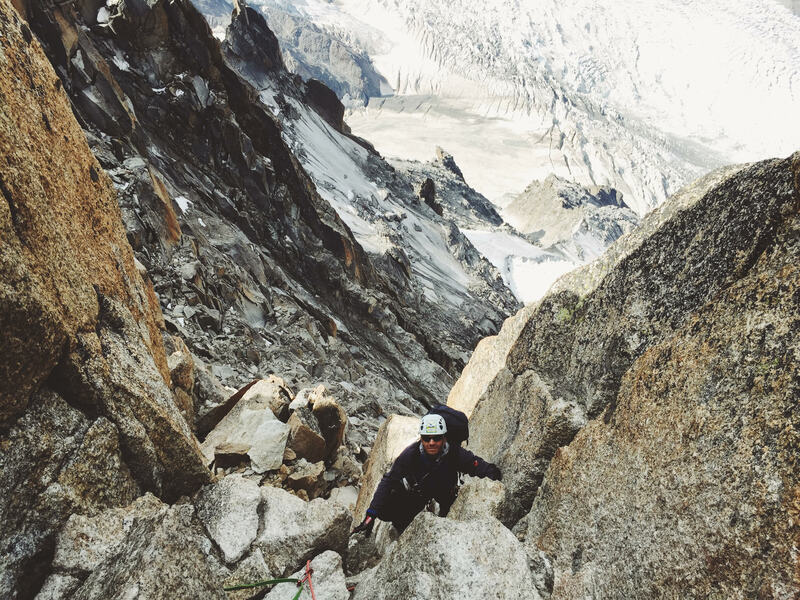 I visited Chamonix a couple of times in my life, but this year was my first time as a climber. 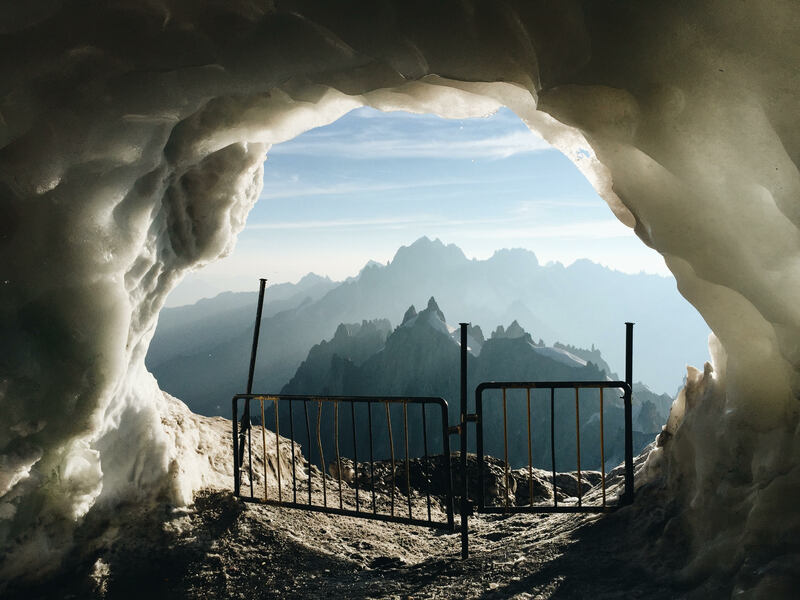 I still remember the first time I went to Chamonix, I was 15 yo and was proud to hike wearing DocMartens and super impressed to see Mont Blanc, to take the cable car to the Aiguille du Midi and step on the glacier des Bossons. It was an amazing experience I shared with my mother and my sister (see picture below). I was born in flat country, the highest “mountain” (as it is called in the area) being 286 meters high. Not a place for serious mountaineering. I like to defy destiny and walk against the wind. I never understood why we should be restrained by geography or social and cultural environment and follow our ancestor’s steps. I see life as an unwritten adventure and I tend to go anywhere I was not supposed to be at first. Challenging myself, learning new skills, living dozen of different lives, traveling the world is my motto. Yes I was born in flat country, away from every kind of unspoiled wilderness, a land of vineyards and infinite fields, a land where being an outdoor man means being an alcoholic hunter. I was lucky enough to have travelers in my family, they gave me the taste to pack and go. Now I need it. For some people, happiness means laying comfortably in their sofa, building their own house, gardening or just watching TV. Everybody seeks the same thing: happiness. But this concept has as many shapes as we are on Earth. My personal happiness is on my next trip. Always the next one. An idea grows in my mind and becomes an obsession, then it becomes a need and finally (sometimes) a reality. I dream of longer trips with big commitment and risk (because without a certain amount of risk, it doesn’t taste as good). I am not suicidal though. When I talk about risk, I mean the willingness to accept risk balanced with my skills in order to stay safe. The risk to safety ratio is really important and should not be taken lightly. In order to go further, skills are needed. And every trip is a bit more advanced in terms of commitment, exploration and happiness. 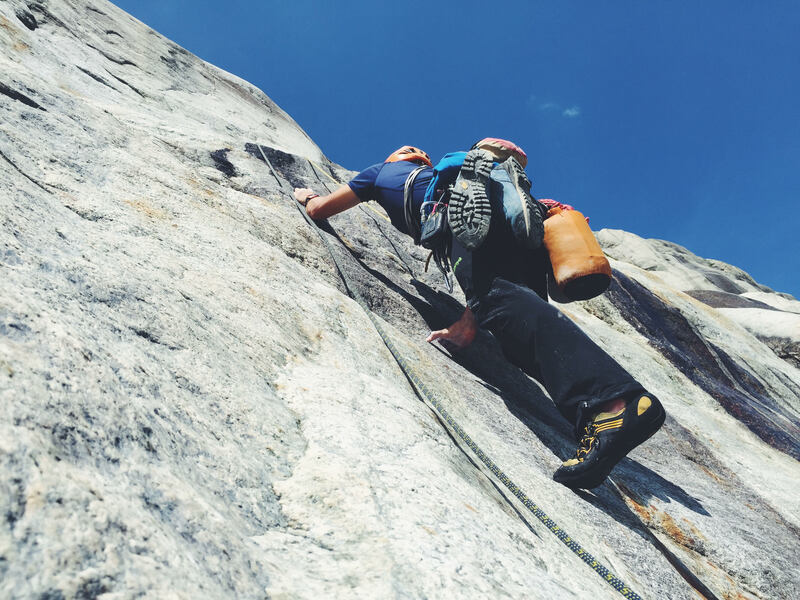 Climbing is a needed skill, it’s a tool that takes me to happiness. It allows me to go places I couldn’t go without those skills. Few months ago, I was planning my Summer. As I said before in this blog, Summer is always too short and I try to fit too many trips and activities during the two month break I have every year (I know I’m lucky, but we always complain and want more, right?). I always try to convince people to go on trips with me, I organize trips and offer my plans to people I think I could get along with (mistakes are easy to make there). It would be nice someday to be invited by a friend on a trip I did not organize myself. 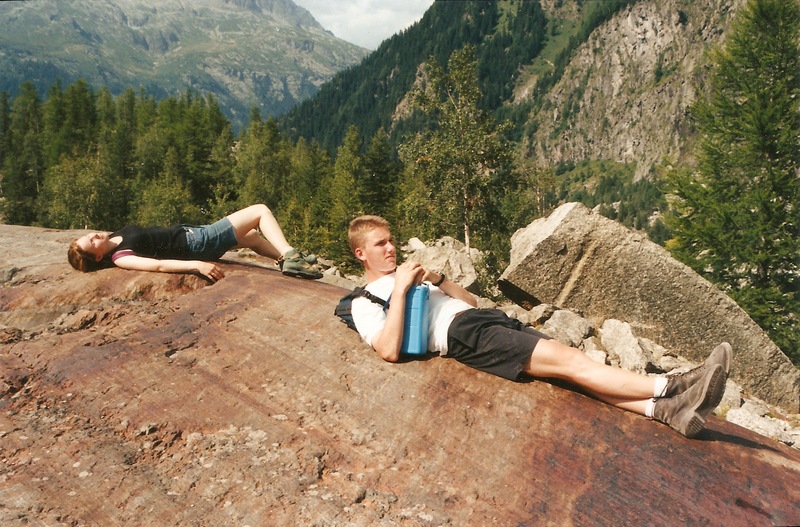 Because he was my first climbing partner (beside my girlfriend), I asked FX to come with me to Chamonix. So I booked two plane tickets to Geneva and started to go through topo guide books in order to find some suitable climbs. At first we did not decide for a place to go: the Alps for sure, but where? It became complicated when my partner started to talk about different places far from each other and some family he wanted to visit at the same time. 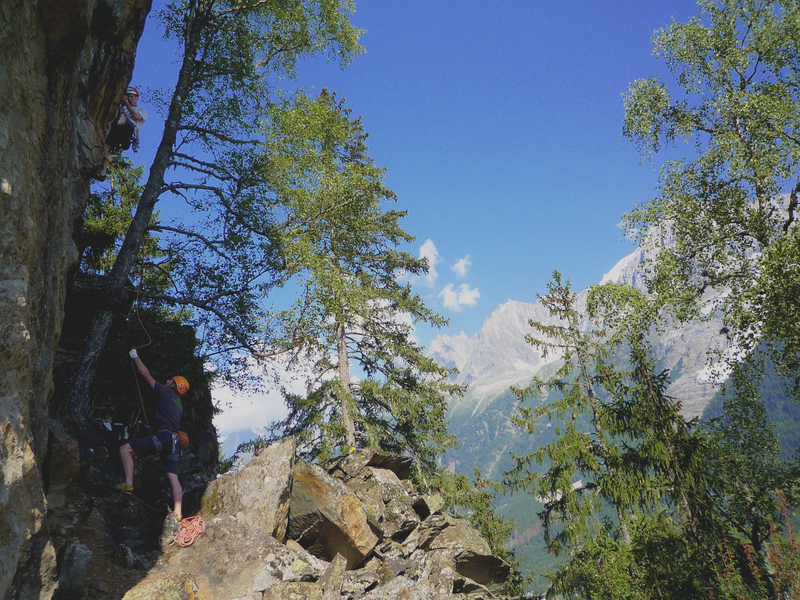 To make sure we would not waste time on any other activity besides climbing, I decided we would go to Chamonix. It was so obvious Chamonix was the place to go, but for some reason we didn’t really talked about it before. Both of us were really happy about this decision. Easy and convenient. At the beginning of August we pitched our tents in one of the dozen campings Chamonix counts for the next twelve days. Les Arolles is a nice camping, filled with climbers and mountain lovers and owned by a former mountain guide and his wife, both really friendly and helpful. It would be our base camp. Before the trip I had noticed on my guide book a nice multipitch route starting from the Mer de Glace, largest glacier in France. The approach on the glacier seemed exciting and my topo mentionned a major and almost perfect 40m crack on pitch 4. 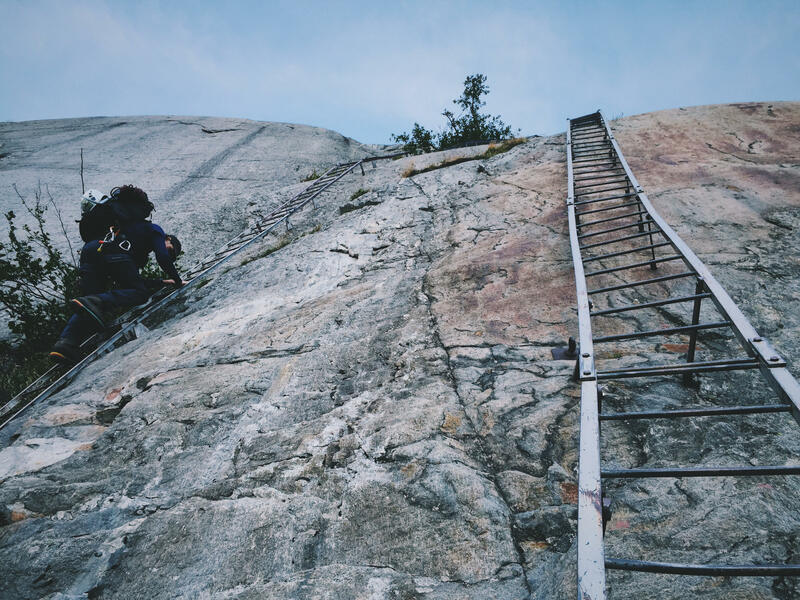 This had to be our first climb in the area: a long and exposed climb with an alpine approach and a fine crack, just the kind of happiness I was looking for. So we went for it. We took the train du Montenvert that took us above the glacier. We climbed down the multiple ladders and stepped on the glacier. The large moraines make it easy to walk on the glacier. At some point we put our crampons on, but it wasn’t necessary and soon realized it would have been faster without. We walked our way through the glacier until we reached the start of the route, we were about to climb the Envers de l’Aiguille. Two Spanish climbers were already roped up and ready to climb. Comparing the topology of the place and the topo, we realized how much the glacier melted since the topo was drawn: in order to reach the “real” start of the climb, we had to climb three or four extra pitches! Plus, the small streams descending the walls were actually proper cascades, we had to climb between these two cascades on super smooth rock without any apparent holds or possible protection. Mental. After a while we eventually reached the promised crack. I was super excited. In order to climb the crack I had to move on a vertical slab that felt like slacklining since no hand holds were available, mental again. The crack itself was amazing, long and sustained with perfect jamming. Some silly mistakes in rope management by my belayer spoiled a bit the experience and made me sweat more than I should have. We ran on the glacier to catch the last train to Chamonix. Wonderful climb and dramatic landscape, a must! This climb, graded TD, is pretty long and some really exposed parts won’t fit the bill for rookies, you should be able to trad climb 6a+/6b. I won’t go through all the days and all the climbs I’ve done during this trip but I will sum up and stick to the main events. The second route climbed a couple of days after was the Clocher du Brévent. 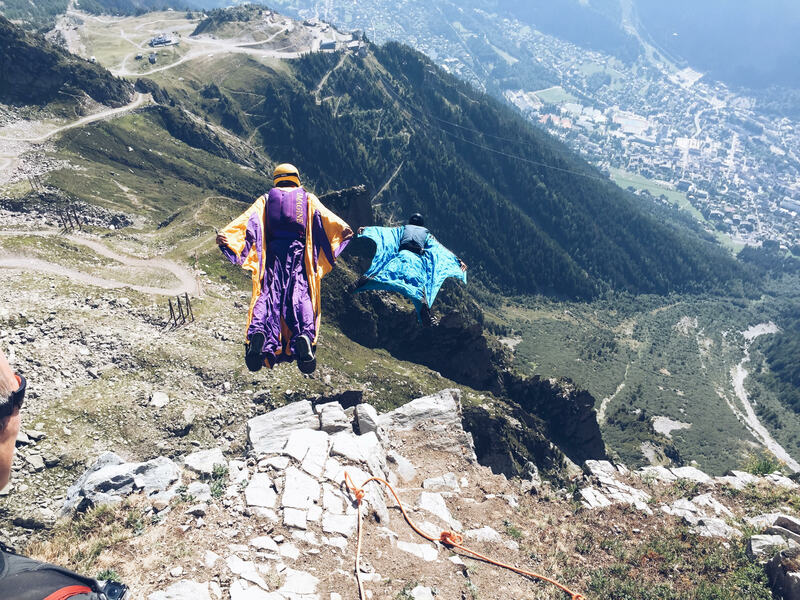 Opposite the Mer de Glace, on the other side of the valley, the Aiguilles Rouges national park is a range of snow free mountains, pure rock – exciting playground for climbers, hikers and base jumpers. Two cable cars take you to the top of the Brévent in a matter of minutes from Chamonix. 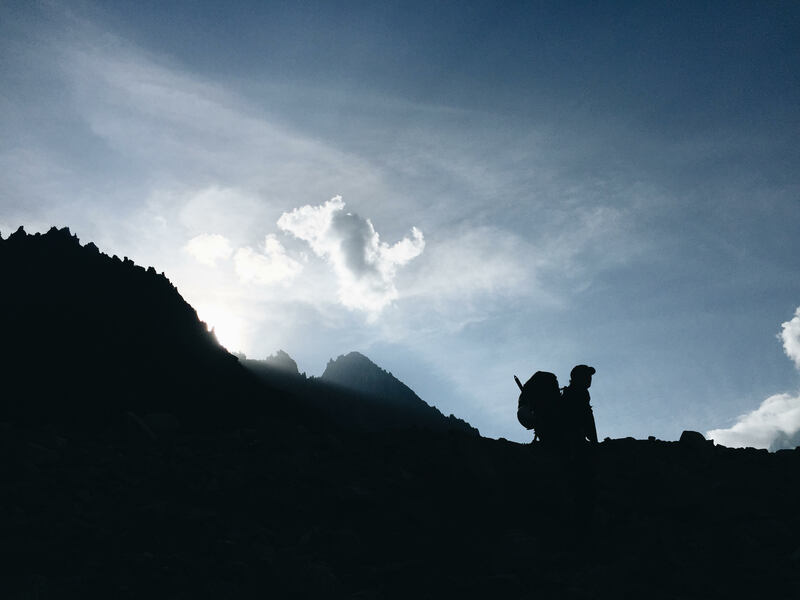 Our plan was to climb the Frison Roche route, named after a famous mountaineer and writer, author of some of the most famous novels about mountain climbing, generations of kids read his books, dreaming of adventures. I was pretty excited by this route and by its name. The route described in chapter one was named after a novel by Jules Verne, one of my favorite novelists. 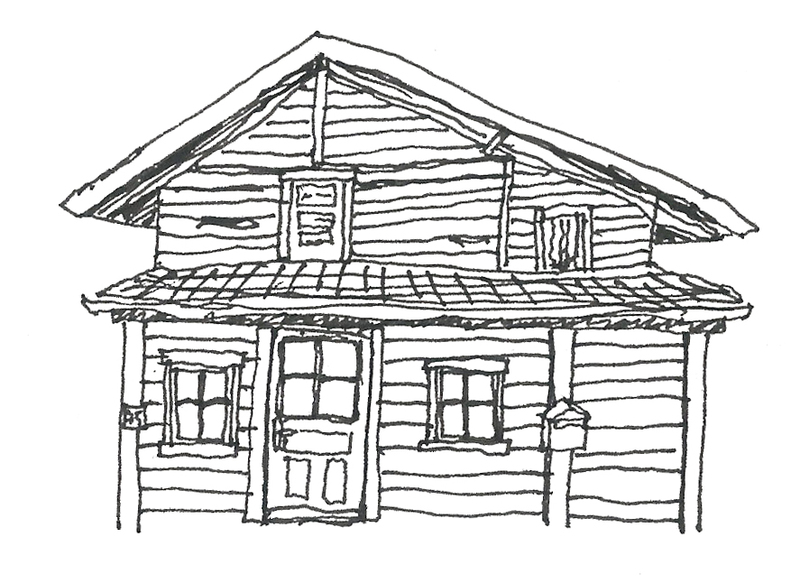 I thought I was going to retrace all the readings from my childhood that took me where I am now. Unfortunately, on our way to the Brévent, from the cable car, we spotted a couple of parties already queuing at the start of the climb. Crowded. I don’t want to queue during the climb, or to have a party behind me waiting for me to climb faster or whatever. I want to climb on my own pace and to enjoy the experience. We decided to change for plan B. The area is full of moderate routes anyway. We went to the Clocher du Brévent, nice pikes to sit on and pretty easy and long climb. 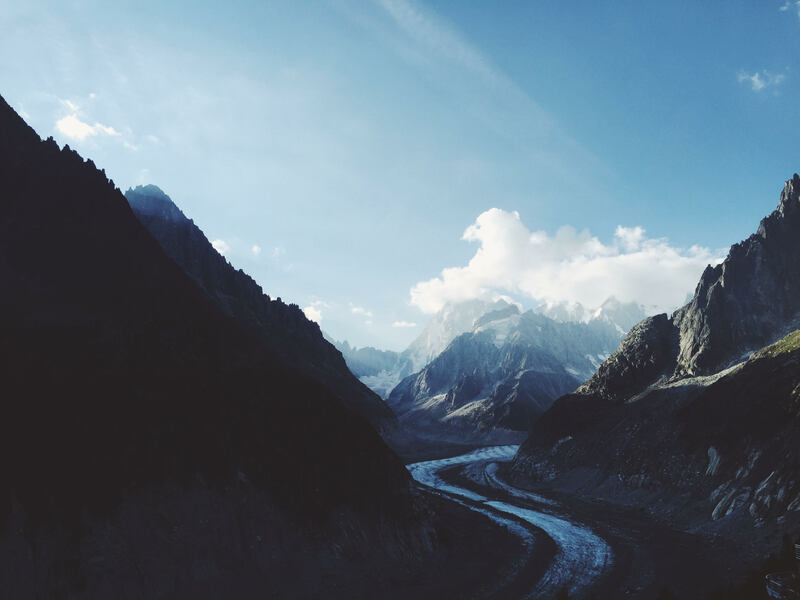 Suddenly a thunder storm exploded over the Mer de Glace, on the other side of the valley. Massive dark clouds arrived and filled the curve of the glacier. A bit anxious and afraid to catch a lighting with all our metal gear, we decided to speed up and shorten the route. By the time we reached the first summit (there were two summits to climb to), the storm was gone and never hit us. Lucky us. We decided to carry on and climb to the second summit. Reaching the top of the mountain was awesome, a real feeling of achievement and an amazing view over all the Mont Blanc range. This climb is graded TD-, pitches are between 5a and 6b, route finding is super easy since everything is bolted, perfect route to go fast and light! My goal for this trip was to climb La Voie Rébuffat on Aiguille du Midi. This route is a serious alpine climb at 4000m elevation. It’s a real classic in the Alps and its name talks for itself, named after it’s opener, Gaston Rébuffat, notorious bold french climber. The route is long, exposed and technical. We woke up at 5am to catch the first cable car to Aiguille du Midi but during breakfast I happened to have a second thought about this climb. My partner seemed to be nervous since the day before. 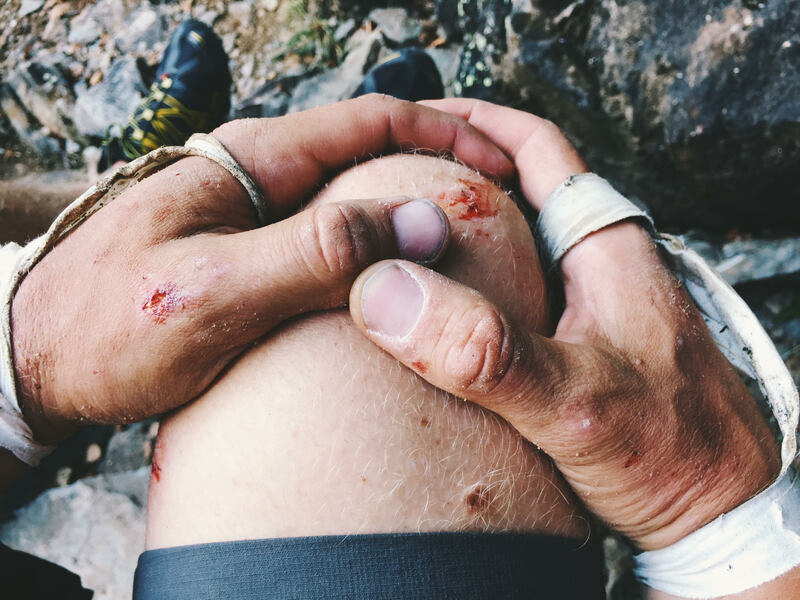 I remembered the rope mistake during our first climb and, like all the previous climbs, I was going to lead all the route myself which means no rest during all the climb and all the responsibility of our success or failure. I explained my thoughts to my friend who appeared relieved by my words. I wanted to test our ability as a team on some short and difficult trad climbs in the valley before committing to this hard climb. We went to Roc des Os (rock of the bones) above Les Bossons. 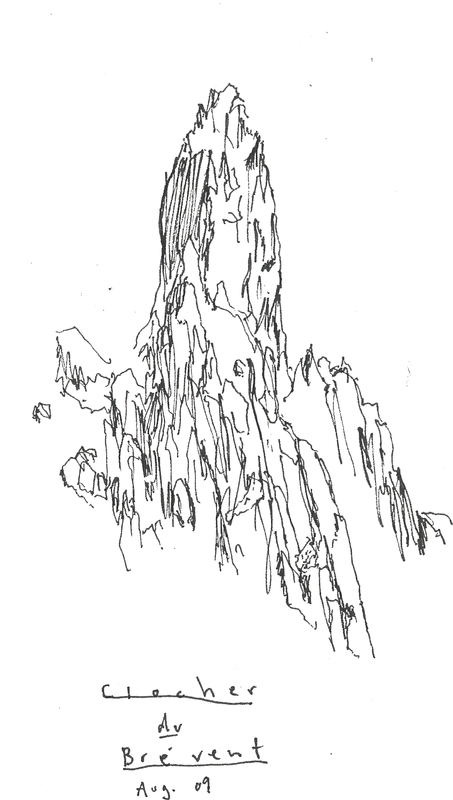 The funny thing about this crag, lost high above the valley, is its approach. 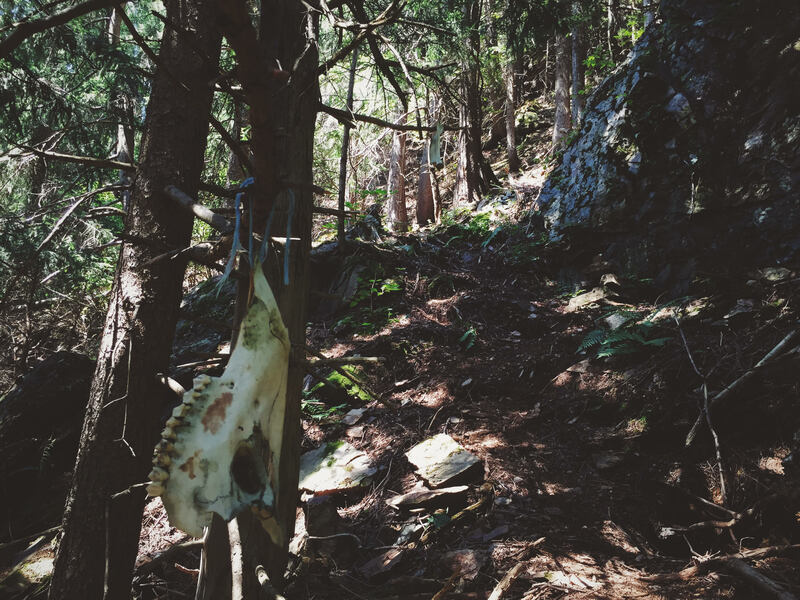 You have to follow a steep trail through the forest marked with bones tied to branches. That gives a nice and relaxing atmosphere to the stroll. We climbed a single pitch overhanging crack and it became obvious our team was not ready to go for this serious climb we had planned before. We had to change our plan. Roc des Os was really nice, a small crag with nice cracks and offwidths. 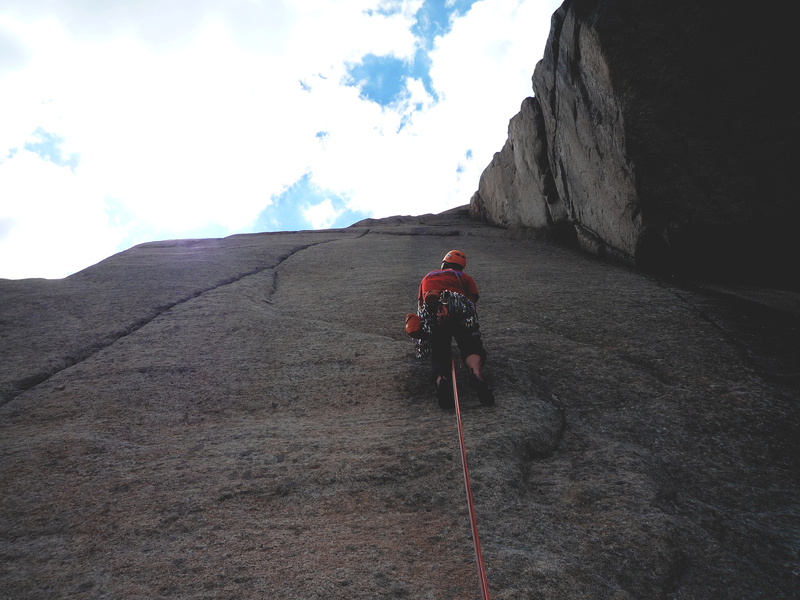 I climbed mostly with Jonatan, a talented Swedish climber we met at the camping. I made the mistake to wear shorts and not to tape properly my hands. Offwidths seriously hurt. View over the valley was amazing and we were lucky enough to witness dusk light over the mountains all around us, majestic. 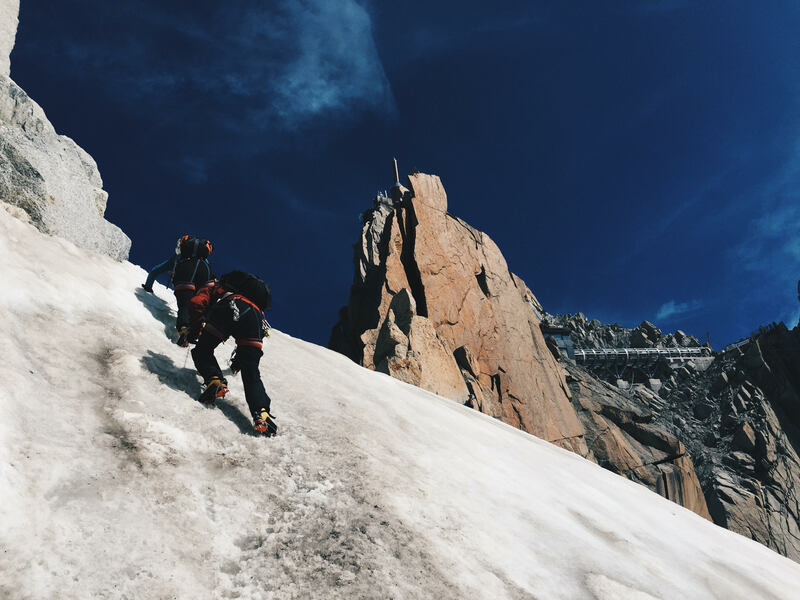 We set up for an easy alpine route at the Aiguille du Midi called L’arête des Cosmiques. 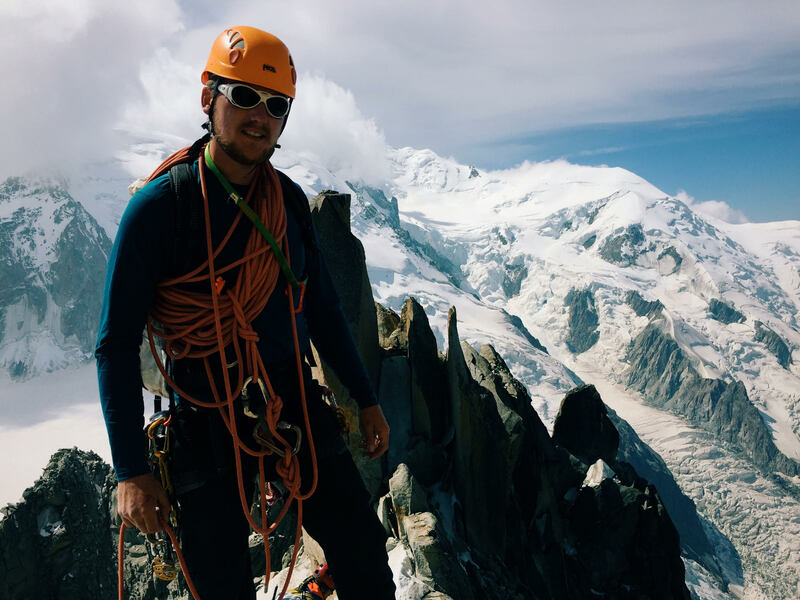 It is a classic piece of mountaineering in the Mont Blanc range and perfectly suitable for beginners. It starts from the observatory where a gate opens to the mountains. 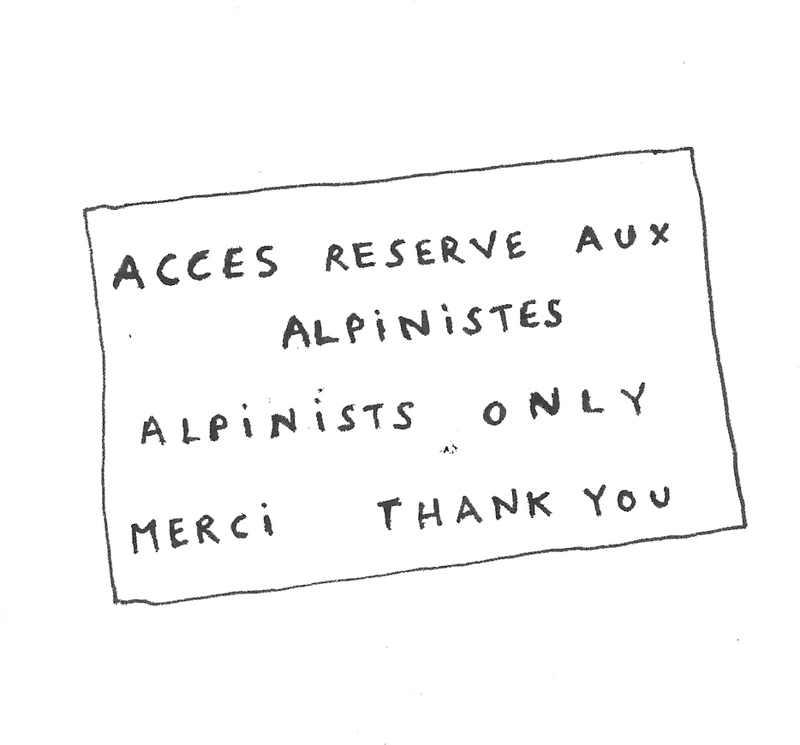 A sign placed at the door reads “Alpinists only”. The first part is a super exposed, steep and intimidating snow ridge. My first steps on it were really scary, I asked myself why I was doing that, what was the point, I could have dived and fly 800 meters straight to the glacier. But the scary part didn’t last for long, after a couple of minutes the trail became wider and safer so I relaxed. We past by the Voie Rébuffat and I thought I took the right decision not to go this time. We arrived at the start of the route and scrambled over big boulders, abseiled and climbed again. The highlight of this route was the short crack section. There are actually two cracks with different grades, the first one is crooked and super easy, the other one is vertical, not hard but more demanding. I went for the vertical crack and found it funny to climb with mountain boots. This post is already too long and this route too much of a classic to add something new to the loads of information you can find on the internet. 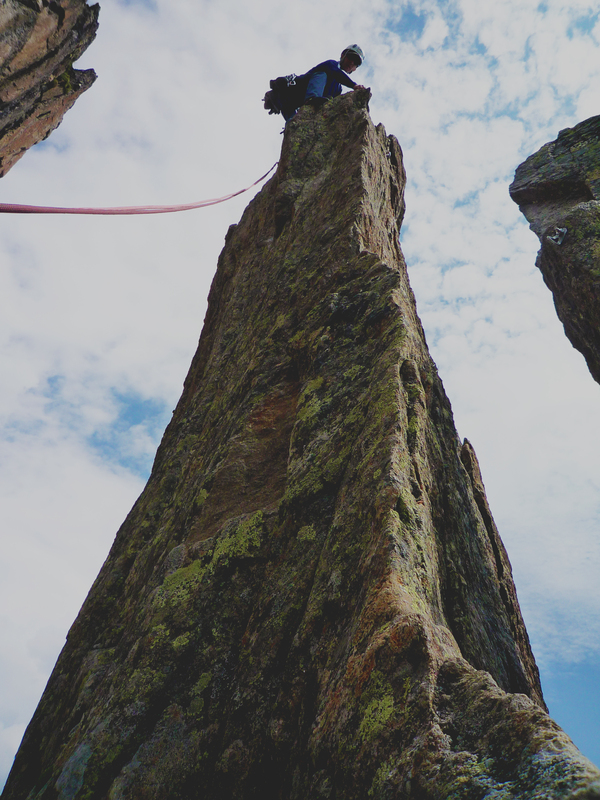 This route is graded AD and is accessible even if you never climbed before (if it is the case, hire a guide!). Note that the approach is extremely exposed and should not be taken lightly. Vindelfjällens Traverse, a packrafting lesson.